This mathematical Voronoi pattern suspended in front of glazing is Design & Display Structures’ latest exciting bespoke GRP project and provides solar shading to the three storey atrium. 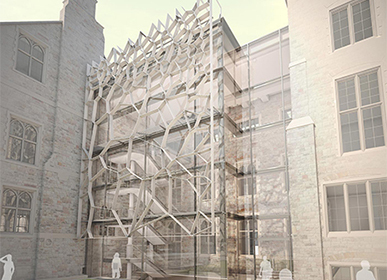 Manufactured in modular cell components it will be shipped and assembled on site Spring 2017 at the University of Bristol Fry Building. The weight saving over steel, the originally considered material, is significant and will contribute to reducing loads on the background support structures.